For over 200 years, the UK Government Art Collection has collected works of art promoting British art and culture around the world. In an unremarkable warehouse down a back alley in central London, thousands of paintings, prints and drawings are lined up in racks, awaiting distribution around the world in a British display of "soft power." The Government Art Collection comprises around 14,000 mostly British pieces amassed over the last 200 years, and displayed in consular buildings, residences and government offices around the world. 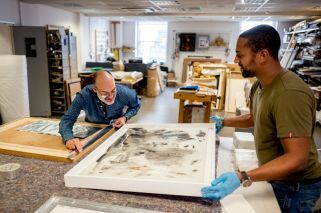 It includes portraits by Lucian Freud and a John Constable housed in Downing Street, Barbara Hepworth screen prints on the walls of the embassy in Bahrain, as well as a Damien Hirst and a William Hogarth displayed in Washington. "Works of art can act as ice breakers, conversation starters, as well as just showing the great creativity there is in Britain," director Penny Johnson told AFP. Some are personal choices of the ambassador involved, others reflect the location. Bridget Riley used the colours of ancient Egyptian painters for her 1982 work Reflection, and it now hangs in the British embassy in Cairo. At any one time, around two-thirds of the collection is on display in more than 150 cities – some in better condition than others. Extreme heat and bugs are one peril in far-flung missions, and curators submit paintings and pictures to a "tropicalisation process", in which the back is lined with silver tape. Some hazards are domestic – an ambassador recently returned a delicate installation to London, fearing it would not survive in his home with three young children. Other works fall foul of diplomatic tensions. Protesters who stormed the British Embassy in Tehran in 2011 in response to sanctions over the nuclear dispute slashed some of the paintings inside, Johnson said. The Embassy reopened in 2015 and full relations restored the year after, but the artwork was only returned a few months ago. "The portrait of Queen Victoria is currently being restored and we are hoping that everything will return to Tehran in December," she said. The collection is government funded, and has a budget of £855,000 (US$1.1 million) this year to cover acquisitions, conservation, framing, transport and installation. But donations help it keep up to date by investing in new artists. The collection last month announced a new commission for 10 works by 10 artists over the next decade, funded by a £500,000 donation from philanthropists Sybil Robson Orr and Matthew Orr. The first TenTen artist is Turner Prize-shortlisted artist Hurvin Anderson, who created the stencil print Still Life with Artificial Flowers, inspired by a vase belonging to his Jamaican mother. One of the limited edition prints has already been earmarked for the Paris Embassy, which has about 17,000 visitors a year, providing a perfect platform to showcase British talent. "Art and culture is one of our great calling cards to the world," said junior arts minister Michael Ellis at the launch of the new project. The collection "is part of our soft power footprint around the world," he said. Britain ranked number one in this year's 'Soft Power Index,' which highlighted its cultural, sporting, creative, financial and technological influence in the world. However, the report – compiled by Portland Communications – warned uncertainty over Britain's exit from the European Union next year has thrown many of these strengths into jeopardy. "Continued investment in the institutions and vehicles that export British soft power will only become more vital as Brexit is completed," it said.